Tag Archive | "Seussical Jr."
Posted on 20 April 2018. Tags: CTA Drama Program, Dr. Seuss, Seussical Jr.
CTA will present its first musical on May 18 and 19! 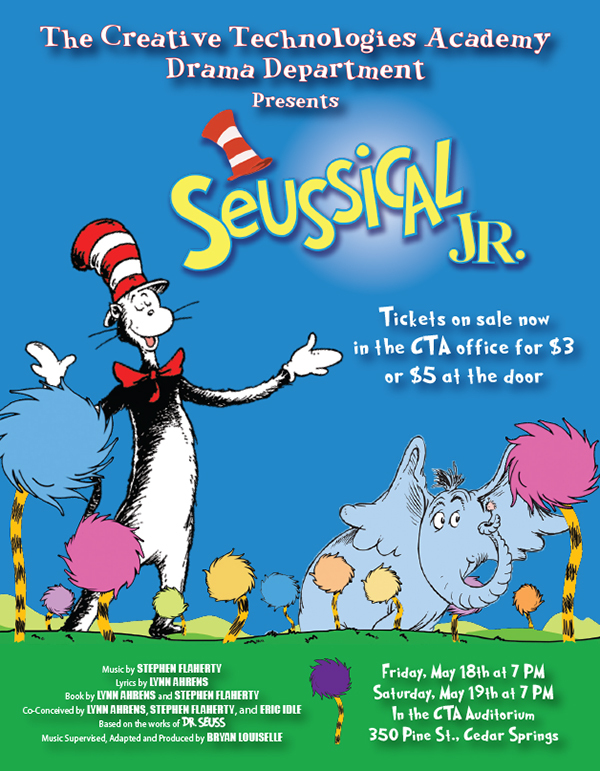 The CTA Drama Program is excited to announce performances of “Seussical Jr.” on Friday, May 18 and Saturday, May 19 at 7:00 p.m. The show will take place in the CTA auditorium. Tickets are on sale in the office for $3. Be sure to pre-purchase because the cost will be $5 at the door. Pre-orders for the DVD of the performance are available at $10 each by contacting Mr. Holtrop. We hope to see you at this fantastical show based on the works of Dr. Seuss!